Maurice Gill Blacksmiths provides high quality metal work at competitive prices. Direct: 07973 252 062 Or Phone: 01304 362771 for a free quotation! Why choose Maurice Gill Blacksmiths? over 40 years experience in producing all types of iron and steel products for both domestic and commercial customers. our blacksmiths are creative and versatile, and are able to create all metal work to an individual design- either from your own specifications, or from a plan specifically created to suit your property. From security steel fencing for homes and schools to light structural steelwork and ornamental gates and balustrades, no job is too big or too small. Looking to add some extra security to your property? Ensure your property is giving off the right impression with our wide range of custom gates, railings and pillars made to measure. Whatever your requirements, you can be sure our committed team of blacksmiths will get the job completed to your full satisfaction! 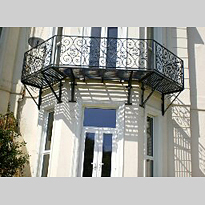 From a banister for your spiral staircase to bespoke ornamental fencing, our blacksmiths are experts in custom-making wrought iron products to the customer's unique specification. Why not have a look through our bespoke items gallery for inspiration? Your imagination is the limit! From a grand scale ornamental garden canopy down to a good old fashioned shoe scraper - Maurice Gill can provide unbeatable quality tailor made to your requirements. Please take a look through our gallery for inspiration, or Contact us to have any questions answered. Garden gate or fire escape in desperate need of repair? Quick and reliable blacksmith when you need it most. Maurice Gill Blacksmith is able to provide repair and restoration work to all aspects of metal work. If your gate or fire escape is damaged, we can offer fast expert welding on site as part of our installation and repairs service leaving your product fully usable again in a flash! However, our repair and restoration services are not just about welding. Our skilled blacksmiths are able to renovate beautiful scroll gates, and any other steelworks which may have deteriorated over time. Worried your metal item may be past restoration? Don't worry! We are experts at replicating designs to exact specifications- you'll barely notice the difference! Has your gate or fencing been damaged during vandalism or burglary? Maurice Gill Blacksmith provides free insurance quotes for customers requiring their metal fencing or gates repairing following accident or crime. We have much experience in the area, including work for Norwich Union- so don't worry; you're in very safe hands!